This photo is not mine, it is ©soapylove and used here to promote a fun giveaway to spread her Soapy Love http://soapylove.blogspot.com/2010/03/wash-my-back-and-ill-wash-yours.html check it out! Debbie is from San Diego (I had friends there in a previous life, Laura for one, and a few people I worked with, never been though). She is a Melt and Pour Soap Artist, she does wonderful things, shares her knowledge and sells gorgeous soaps too. Go have a look, if only for the eye candy value, and if you're a soaper, wash her back too. This is all to promote her latest issue of Let's Get Soapy. 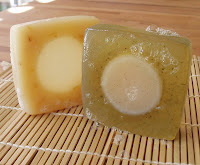 as for me, I made more half egg soaps last night for the girls at work, made half "Chocolate (AussieCandleSupplies)" and half "Passion Fruit Rose (BrambleBerry), they all smelled so nice, and I had a bit of soap left from each so I have a marble soap for us at home! I plan on catching up on my sleep this weekend :) a looong weekend! Yay!!! Cheers and if you are going to have chocolate, enjoy it!! I am loving Debbie's new natural soaps, too. She is so talented!